Dreamland Pavilion was an early-20th-century Seattle hot spot for skating, dancing, conventions, speeches and shows of all sorts. It made way for the Eagles Auditorium in 1925, and ACT Theatre took over in 1996. ONCE CAMERAS COULD BE used comfortably outdoors, commercial photographers promoted portraits for families posing on the porch or front yard, and for businesses grouping owners with employees in front of the shop or factory. This week’s feature has both, with a variation. The man in the dark suit nearest the camera in this week’s “Then” photo is probably Syvert Stray, proprietor of Seattle Dairy. He is standing beside, we assume, his wife, Lillian, while holding on to the high wagon chair, where his daughter poses for the photographer. Down the line are the horses and drivers for Stray’s milk wagons. The twist in this group portrait is that the subjects here are not posing beside the company’s office and/or livery on Eighth Avenue. Rather, they are around the corner, on Union Street. The reason is obvious: They are sharing the splendor of a new and magnificent neighbor. This is the showy south facade of Dreamland Pavilion, a hall that filled the northeast corner of Seventh Avenue and Union Street. This ornate landmark was made for entertainment and engagements. 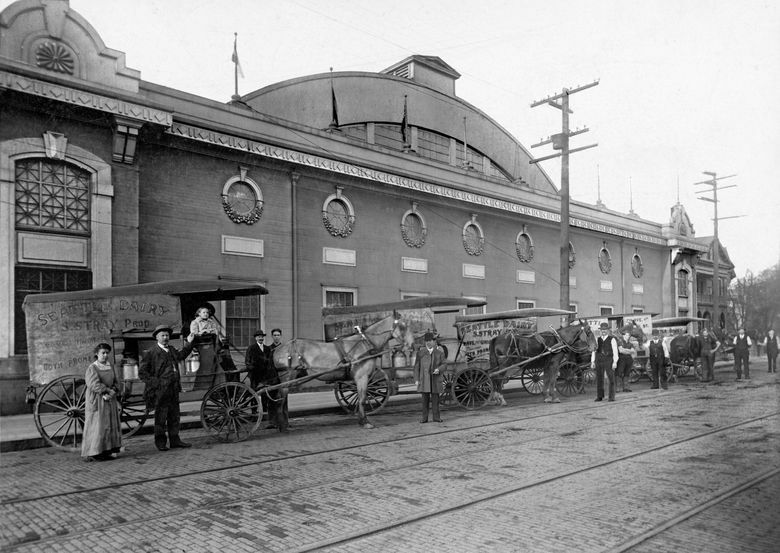 From its arching roof to the hardwood floor, the big room was made for dancing, skating, conventions, banquets and shows of many sorts. Dreamland also was the political platform of choice for progressives, labor unions and political campaigning. The dances thrown here were big ones. And the sweating populist spectator sports of boxing and wrestling could fill the place. From its beginning, Dreamland was promoted primarily as a roller-skating rink. The opening was “by invitation” on Oct. 14, 1906, for the Monday Night Skating Club. The following night, it was promoted in The Seattle Times as “the ideal rink for discriminating skaters … (with) … Prof. Chas L. Franks and his daughter Lillian performing as Champion Fancy Skaters.” Stray, Dreamland’s dairyman neighbor, was into roller skating, sponsoring a competitive team in the Seattle Roller Hockey League. In 1915, after Stray bought a truck, an illustrated advertisement of the purchase appeared in The Times. Like the milk wagons Stray was replacing, his new truck was partially covered with a sign naming his dairy. Stray’s spirit for internal combustion developed into his second entrepreneurial passion, as director of McKale’s Inc., a small chain of stylish service stations. 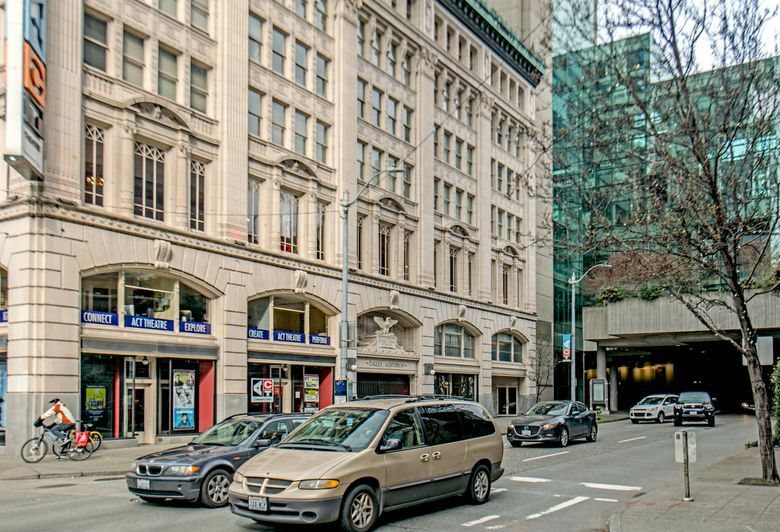 The first McKale’s was on the northwest corner of Union Street and Eighth Avenue, two doors from Stray’s Seattle Dairy. Born in Norway in 1871, Stray reached the United States in 1888 and Seattle in 1902. Before his death in 1934, he was a life member in The Fraternal Order of Eagles, whose elegant building replaced Dreamland in 1925. Since 1996, it is a corner where the play has continued with ACT Theatre.